Rio de Janeiro: Editora Rocco, 1996. 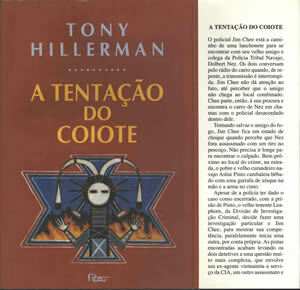 This is the paperback edition of Coyote Waits translated into Portuguese by Aulyde Soares Rodrigues and published by Editora Rocco Ltda in Rio de Janeiro, Brazil, in 1996. The Portuguese title translates as "The Temptation of Coyote." The cover is red and features Peter Thorpe's original artwork from the first US edition. Binding: Full-color paper covers. The author name and publisher logo are printed on the spine in gray, on either side of the title, printed in yellow-orange.